Magic: The Gathering has issued a rare emergency card ban effective today. One card in a popular but dramatically overpowered two-card combo is now illegal in Standard play. Publisher Wizards of the Coast announced Felidar Guardian’s emergency ban two days after they put out their April “Banned and Restricted” cards list, prompting players to raise an eyebrow at the delay. 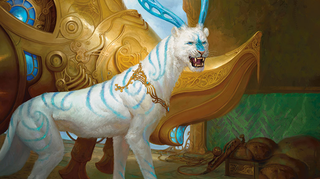 Over the last few months, Wizards of the Coast noticed that, when Felidar Guardian and Saheeli Rai are in play together, Felidar Guardian can be infinitely replicated until its owner has an army of lethal cats. It is known as the Copy Cat Combo. About 40% of Magic Online Standard League decks contained the combo—a percentage that does not reflect how often it was built into IRL decks.